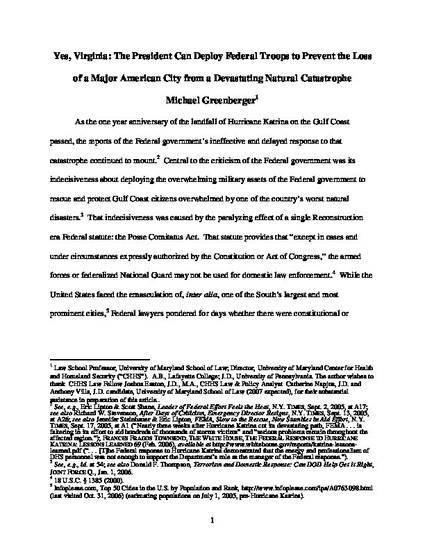 As a direct response to the lackadaisical and much criticized federal handling of Hurricane Katrina, a critical provision within the Fiscal Year 2007 Defense Authorization Act amended in October 2006 the Insurrection Act to allow the President to deploy Federal troops to respond to catastrophic natural disasters and other major domestic emergencies without a prior request from affected state or local governments. This amendment was passed over universal and bipartisan opposition by the Nation's governors, all of whom claimed that this provision upends the delicate balance between Federal and state responsibilities for responding to natural disasters. In fact, this amendment neither adds to the President's power, nor detracts from that of the states. The amendment applies only to major catastrophes where the resources of states and localities have been overwhelmed – situations to which the President has always had the power to respond. Yet uncertainty has often surrounded the President's power, and, as seen in Hurricane Katrina, this confusion has often caused devastating delays in its use. The amendment to the Insurrection Act merely clarifies the President's power and is fully supported by the Constitution. 26 Mississippi College Law Review 107 (2006).